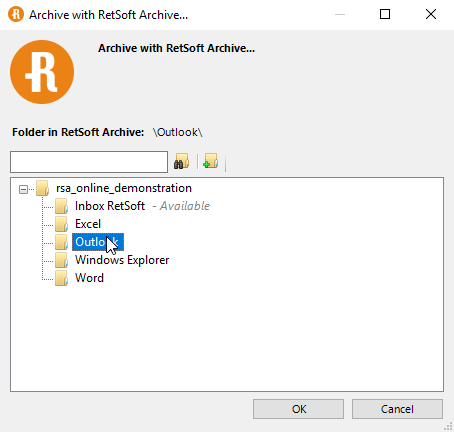 Read here how you can import and archive e-mails (Outlook) and Office (Word, Excel, Windows explorer) files in RetSoft with a few simple steps. After installing RetSoft, you will see a new RetSoft button appear on the right-hand side of your screen in Office. The RetSoft button is identical for all of the supporting programmes. By clicking on the RetSoft button, you can archive the selected email message, Excel or Word file in RetSoft. After clicking on the RetSoft button, the below pop-up screen will appear (see screenshot below). On this screen, select the folder you want to save the email message or file to. Click on OK. The below pop-up screen will then appear (see screenshot below). The selected files have now been copied to the RetSoft mailbox. If we now go to the RetSoft mailbox, we get the following notification. Click on Yes and RetSoft will move the files to your chosen folder. You can also use RetSoft to archive attachments from Outlook. Click on 'Archive with RetSoft'. A new pop-up will appear. On this screen, select the location you want to save the attachment to in RetSoft. Click on OK and you will get confirmation that your files have been copied to the RetSoft mailbox. When you open your mailbox in RetSoft,you will get the below message. We can do the same for files in Windows Explorer. Use the right mouse button to click on a file. The option 'Add to RetSoft' will appear. 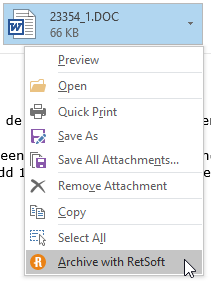 Just as it did when archiving from Outlook, another pop-up screen will appear with the option to select a folder. A notification will subsequently appear informing that the files have been copied to your RetSoft mailbox.